I'm not here to burst bubbles but we all know the truth is that human do still care about first impressions. Even after all that Meghan Trainer body image song, it still boils down to how we portray ourselves to others in a glance because hey, ain't everyone got time to sit down and have a deep conversation to get to know you better. Don't get me wrong, I'm not talking about size here. I'm talking about how well you clean up, your posture, and the way to talk. I remember my mom always tell me to iron my clothes before I wear them out, to stand up straight, to close my legs when I stand, and to not laugh like a crazy woman with my mouth wide open... ermm.. I'm still working on that last one. I didn't really get it when I was younger, I always thought it was annoying and I should be able to do what I like and people should just like me for who I am. It's true, people should like you for who you are! But being a woman in the real world is a task, we've got to look confident while exuding poise, and these can happen to all girls if most of us believe we can by starting with spending the extra effort to take care on how you look physically. By knowing that you look good, you'll feel great! A little mascara makes you look a whole lot more awake, a little blusher oozes a healthy flush, the right red lipstick completes your entire look, and a little lotion every day after shower will keep your skin moisturised and soft. All these goes hand-in-hand with your dressing too! I'm not quite sure when did I started my body lotion habit, it has been quite a while now, but one thing is for sure, it wasn't an overnight thing. It was cultivated and learnt about the importance of using first a sunscreen, and then a body moisturiser if I want to see myself having a nicer looking body when I'm older. Everything I do now is for my future me, I don't want to look back with regrets of not taking better care of my skin. I've recently gotten some Nivea products and generally, I will always pick something anti-ageing and something for crazy moisturising effect. So, here are my two top choices, Nivea Anti-Age White Firming Body Serum and Nivea Intensive Moisture Serum. Extra White Firming Body Serum, I think if you are living in a country where the sun is always up, you should have this in your room and use it as a day moisturiser as it has SPF in it. 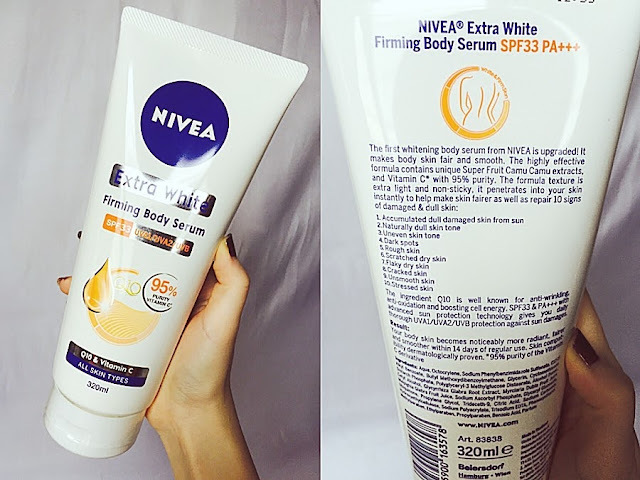 Nivea is known for their whitening products and I think it's a misconception to think that I'm fair enough so I don't need whitening products. I always believe whitening products' job is not just to whiten, it also helps to even up your skin tone. I usually get sunburns from the beach on the corners of my shoulders due to the design of my swimwear, and it will leave me with a two-toned shoulder. Thus, it's important for me to try to get them back to what they used to look like with the help of whitening moisturiser. Nivea named these range as serums because it's lighter than a regular lotion to cream and it's less sticky as a serum do usually absorbs faster into your skin. Also, it smells amazing! I love body moisturisers with light fragrance that somewhat lingers a little, you'll mostly notice it when you smell your skin. Trust me, your guy will love it too! I'm really curious if the firming claims to be as good because I have used firming products that made me felt amazing after using for a long time. I'm going to give myself about 2 weeks to try them and get back to you on it. Though, so far, Nivea serum range caught my attention and heart. Love this post!!! But i dun use lotion mayb jus once in a while hahaha mayb different skin type!